The Story of How Community Planning Came to O.B. 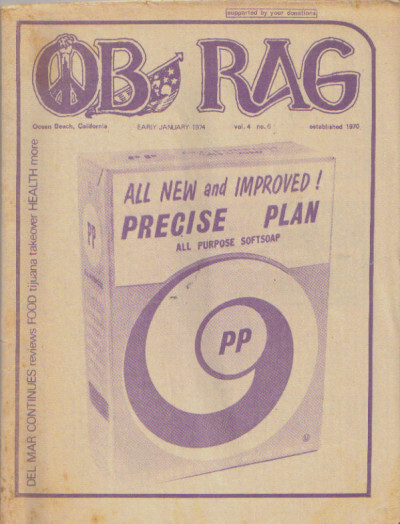 OB Rag cover, early January 1974. Last we left off was the Spring of 1972, when the City Planning Department canceled or postponed all its meetings or workshops on the Pen. Inc sponsored Precise Plan. This was due to the establishment of a substantial opposition to the plan, which was in the form of a damning survey of resident attitudes toward development, high-rise and density increases, and a petition calling for a building moratorium signed by thousands. So, in the spring and summer months of 1972, the crisis was over – at least temporarily as Ocean Beach had awoken, and its residents had successfully halted the threatened onslaught of massive development. There appeared to be a lull … for about 6 or 7 months. The lull didn’t last. In early 1973, the city began making noises about getting the same old Precise Plan before the San Diego Planning Commission for its approval. This once again caused activists to mobilize, and about 20 people – from OB Ecology Action, the OB Rag and Save OB Committee – met in mid February to plan an organizing meeting. Its goal: to once and for all put together a planning committee for Ocean Beach. They prepared a slide show and leaflets were distributed. And on February 28, 1973 over 80 people met in the auditorium of OB Elementary and formed the Ocean Beach Community Planning Group (CPG). Immediately, a temporary steering committee was put together and revisions to the Precise Plan were begun in earnest. This new planning coalition represented a coming together of OB Town Council liberals, OB Rag radicals and Save OB committee environmentalists, with activists also coming from the “new alternative institutions”, such as People’s Food Co-op and the Free School. By April 1973, a permanent steering committee was elected democratically – including this writer – to guide and represent CPG. This was significant, as it displayed clearly to the City that there was an organized and serious opposition to the Pen Inc plan. A month later, by May, the City agreed to slow down the process and wait for input from the new CPG. Detail map from original OB Precise Plan. A page right out of the original Precise Plan, 1971. 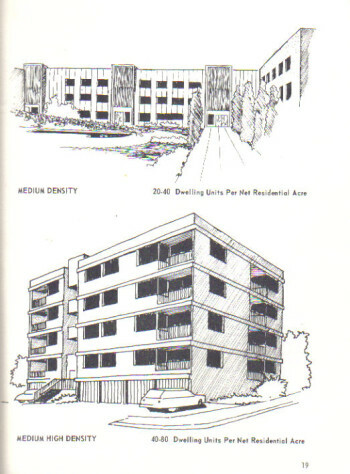 Both medium density and medium high density were encouraged. After these months of input and feedback, the City spent the fall and early winter cranking up its planning and printing departments and published what was called a “Draft Revised Precise Plan“, making it public in mid-January 1974. Activists were elated. Gone were any indications of a planned “mini-Miami Beach”, deleted were any plans for the wholesale gentrification of northwest OB, and there were no allowances for high-rise buildings. For the Community Planning Group activists and leadership, this was a partial victory for they felt vindicated that most of the negative elements of the original Pen Inc – sponsored plan were just simply gone. The new revision, then, definitely took the edge off the planning crisis. But things were not quiet. The Community Planning Group had been expanding its base within the community. In early October 1973, it held its second election for the steering committee; OB had been divided into 5 districts and each district elected 3 representatives to the steering committee. This was no private affair. There were 5 polling places set up in front of stores around OB. There were 20 candidates running for the 15 seats. And an amazing 639 people participated in this grass-roots election. Of note, local architect Rob Quigley, was elected to the Steering Committee – as was this writer. CPG acted almost like a local political party; it generated pamphlets on planning issues, it published a newsletter distributed throughout OB – and downtown, it held “cheapie” dinners to raise money; it hosted a benefit movie where 500 people attended. And of course, there always seemed to be a petition in the air. The Committee of 12 continued to meet into 1974. A number of issues remained contentious, and in March of 1974, Town Council representatives and CPG Steering Committee members wanted to resolve them. The thought was ‘let’s test the sentiments of the community on these issues’, so a vote was taken by the committee to hold “community elections”. Due to a split among the Town Council reps, however, the Pen Inc delegation was able to vote the measure down. But the issue didn’t go away. At the very next meeting of the committee in April, there was another vote for the election – and it won 7 to 0 with 5 abstentions. Perhaps these numbers were unsettling to the City planners and the local establishment. An ad hoc voting bloc on the committee was sustaining a majority on key issues. It’s then possible that a number of important people felt that the voting bloc was being too radical and had to be somehow reigned in. Or simply that there was a sentiment on Newport that local merchants weren’t adequately represented. So, in June of 1974, the committee expanded to 16 members when the City allowed a fourth group to enter the negotiation process, the OB Business and Property Owners Association. OB Rag cover, 1974, depicting large apartment under construction on bluffs of Sunset Cliffs. The City finally took everyone’s input, emphasizing any consensus on issues that the Committee of 12/16 came to and began writing up a new plan for OB. On the grassroots level, the Community Planning Group continued to hold meetings, and its activities – and importantly, were able to respond to any new construction projects during the remainder of 1974 and into the new year. The construction projects – mainly of large, bulky apartments – were still coming down the pike. Over this period of time, CPG was able to block the construction of eight 5-story high-rise apartments, most of them planned for Sunset Cliffs. It allowed a 33% increase in population density over a period of time – this was a no brainer to oppose – no one wanted to see that kind of massive growth. There were no plans for the development of low and moderate income housing. Immediately, CPG launched a petition drive to add its own amendments to the Plan, amendments which would nullify some of the worst affects of the city’s version, and which would add a community-wide election process for a committee to implement the plan. The Plan went before the Planning Commission in April 1975, and before a City Council sub-committee on June 18th. Time was drawing near for the July 3rd showdown at City Council. OB activists continued to circulate the petitions, and all the hub-bub began to draw mainstream media attention. After 3 to 4 months, 3500 signatures of OBceans had been collected – this was a powerful tool – for there were only about 13,000 people living in the community. It was a packed City Council Chambers on that fateful day – July 3, 1975 – a chambers filled with OBceans. OBceans of all kinds and sizes. Despite their differences they were there for one reason: to get their community plan, and to get their democratic election of a planning group. After all the public testimony and speeches, after more discussion among the politicos, the City Council – with Mayor Pete Wilson at the ceremonial helm – passed the OB Precise Plan. The vote that passed included 5 of CPG’s amendments – all intact and another 2 with compromises. The most important amendment – the provision for a community election of a planning committee – was among those included in the package. The City Council vote was truly historic. Hell, it was earthshaking. Never before in the history of San Diego had a neighborhood been allowed to hold its own election for its own planning committee. This was to be a first for any community in the city. OBceans returned home full of hope and pride that they had won a significant victory. They had torn victory out of the mouths of Pen Inc, and by the sheer weight of their numbers, their signatures, their petitions, their persistence – and had forced the implementation of a never-before-seen element of community planning – an election of local planners; it was indeed a democratic revolution in the arena of urban planning. Any “citizen” could vote in this OB election – even renters. And of course, OB then and now, is primarily made up of renters. Six out of every 7 OBceans rent. That August 18, in the year 1975, the Community Planning Group presented its ideas for a community-wide election, an election that would be monitored by the League of Women Voters. City Hall and Mayor Wilson – still with his green tie on – were okay with all of this. And for awhile, it looked like the election would coincide with the November General Election of 1975 – which gave activists hope for a large turn-out. But it wasn’t to be yet. It wasn’t quite time for OB to get its election, as it all got sidetracked. All the plans to move forward went awry when a small number of OB politicos went back to the City Council and complained that the July 3 hearing was “unfair” as their side didn’t get enough time at the podium. They vehemently insisted that the City re-open hearings on the Precise Plan. All this kicked the Plan back to the Council Rules Committee. Just who was this small group anyway that wanted to de-rail the wishes of thousands? And just how did they achieve such political pull? Along side Miller was Don Norris, an older, more reclusive type extremist whose mother ran a breakfast cafe on Voltaire Street in OB. Both Miller and Norris wore a small silver hangman’s noose around their necks – the symbol of the Posse Comitatis – a national group which they belonged to whose core belief is that only the elected sheriff in each county is the rightful authority. The three had managed to be selected as the leadership of an ad hoc coalition made up of Pen Inc – the originators of the Precise Plan, a sympathetic faction of the fractured Town Council, and of the Merchants and Property Owners Association. They sent out letters protesting the adoption of the new Plan, and publicly complained that 2700 property owners had not been adequately notified of the changes. They didn’t mention that in fact all 3 had participated in the “Committee of 16”. 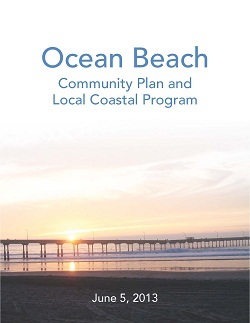 OB Community Plan 2013 – 14. In the end, their maneuverings forced the City to hold more meetings and put off the implementation of the new OB Plan. On September 25, 1975, the City Attorney ruled that the City Council hearing on the OB Precise Plan on July 3rd hearing was fair and legal. The three went to the Council itself and demanded that it reopen its hearing. On October 16th, the Council met and decided that their earlier meeting of July 3 was fair – and they refused to open up the hearing. In effect, the San Diego City Council passed the OB Precise Plan twice – once on July 3, and then again a second time when they validated their original vote. At the same time, the Council postponed a hearing on the election procedures, as it could set precedent for the entire city and all its communities and had to be studied closely. Then on December 11th, during a routine procedure to include the OB Precise Plan into the City General Plan, an attorney representing the ad hoc property owners and merchants coalition sought a continuance on the grounds of their opposition to a Planned District. This caused some more delays. Finally, after all the delays, the Council set May 4, 1976, as the date for the community-wide election to select the very first planning committee for Ocean Beach. All residents, all property owners and all business owners could vote. And it would be monitored by the League of Women Voters. The Community Planning Group spun into action. It set about preparing for the election by creating a process by which local residents could vie to be included on an organizational slate. Out of a field of 35 candidates, 14 were selected to be candidates representing the group – including the late Phil Esbree – along with this writer. CPG also began internal discussions that would lead to the creation of an amazing campaign platform that the official candidates had to endorse. By today’s standards, the CPG platform was very green, very progressive – and way ahead of its time. Or was it? Once the campaign for OB’s committee began, there were some nasty edges. A hate letter went out supposedly from “the Silent Majority of OB” denouncing the election and those involved. There was some more fear-mongering which resulted in the formation of a slate opposed to CPG. Yet taking part in the vast organizing and mobilizing for OB’s election was a memorable, exciting and moving experience, as dozens of OBceans became volunteers to help manage the election and thousands took part. The CPG candidates went door to door in their districts, and it turned out this was very effectual, as it was an election close at home, involving the very neighborhoods people lived in. Interest was high. Just five months before the election, another roadblock was thrown up. This time it was a law suit filed in yet another attempt to halt the election. An injunction was sought by the same three who had tried to earlier derail the Plan: Miller, Norris and Ridenour. The grounds for their injunction? The City Planning Department failed to send out proper notices to OB residents, property owners, and business licensees. Plus, they asserted, the residents and property owners east of Froude should be able to vote – as they have an interest in the election. The City Planning Department’s response was matter-of-fact: it used 3 mailing lists to insure registered voters, property owners and business were notified. In addition, the City put out multiple news releases concerning the election, and plastered 50 posters around the community. The City also made the point that residents in Point Loma and Clairemont have an interest. Should they vote too? Critics of the injunction attempt saw it as a last ditch effort by those who wanted to forestall the inevitable – the end of some merchants’ dreams for the commercial development of Ocean Beach. A judge threw out the lawsuit, and the three vowed to fight on to the federal courts – they didn’t, they were done. Finally, the election was truly on. As CPG campaigned, the opposition slate formed. It included the president of the OB Merchants Association, the owner of a Newport drug store, a former City Councilman – Henry Landt, and primarily other businesspeople. As part of its campaign, CPG led a large voters registration drive as the rules stated that only registered voters could vote as residents in the election. With the election only 3 days away, CPG held a May 1st Community Celebration at the foot of Saratoga in the park, with speakers, music, contests and games for kids. The May 4th, 1976 election day in OB finally arrived. The village was divided into 5 voting districts, and there were 1 to 2 voting sites per district, mainly in front of markets. The balloting took place all day – and at the appointed hour, the ballot boxes were taken to the OB Rec Center for counting. All monitored by the League of Women Voters. The votes and voting were astounding. Thousands voted. In District 1 alone, 851 ballots were cast. 1,108 voted in District 2. District 3 had 755 votes. Another 1,085 voted in District 4 – the business district (where this writer lost by 8 votes). The lowest turnout was in District 5 – with 696 votes. All told, just a hair less than 4500 ballots were cast (4495) in OB’s special election. This was out of a community population of 13,000, where 6,100 registered voters were eligible, where 2,100 property owners were eligible (1,100 inside the plan area and 1,000 outside the area), and where 600 business license holders were eligible. This is a 51% voting rate – very decent by today’s standards. Eight of the 14 seats on the first Planning Board were captured by Community Planning Group candidates. They included MaryAnn Zounes, Rich Cornish, Tom Kozden, Lars Tollefson, Doug Card, Phil Elsbree, Dolores Frank, and Chris Bystrom. Other members of the first Board included: Phil Silva, James Bull, Stratie Paras, Rose Dishon, Joe Willingham, and young Michael Akey. The sweep by CPG candidates was incredible. And empowering. A small neighborhood organization had grown to be the majority on the first planning board democratically elected in the city’s history. 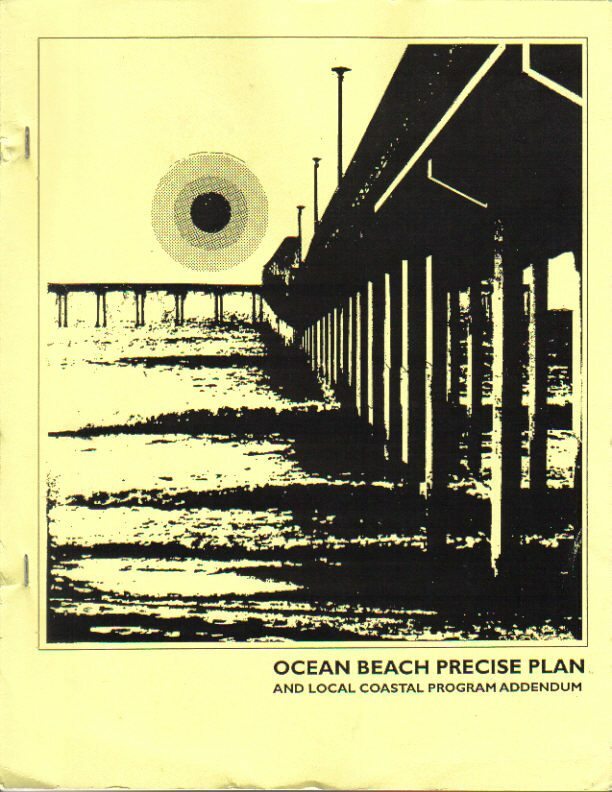 Looking back, Ocean Beach’s very first Planning Board was quite innovative compared to the procedures and operations of the later planning committees in OB. The first board met in the cafeteria of OB Elementary – and started the tradition of meeting the first and third Wednesdays. The Board actually maintained an office at 4741 Santa Monica Avenue, where residents could visit, people could get renter’s information, where building permits could be applied for, and complaints on city services could be left. The Board used rotating chairs, and managed a host of committees, such as a Government Review Committee, a Community Life and Environment Committee, a Community Economics Committee, and a committee on Park, Recreation and Beaches. 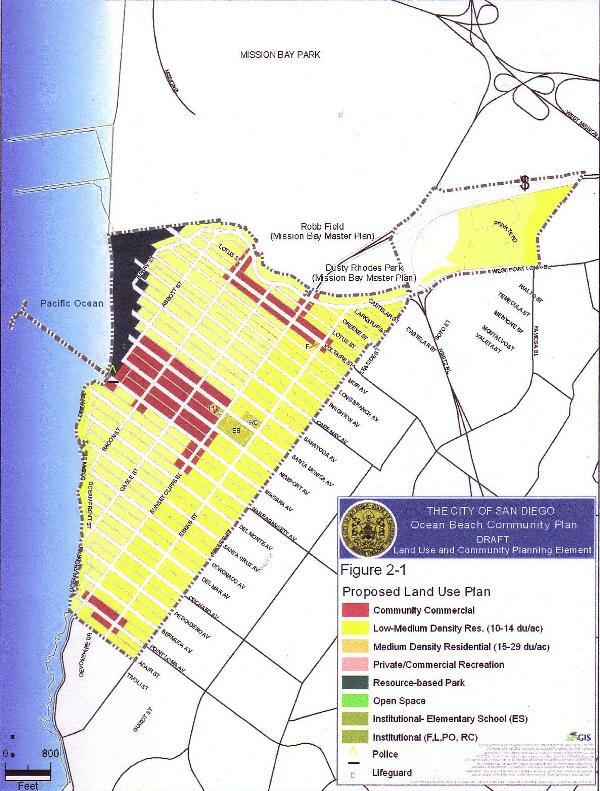 One of the Board’s first major issue was dealing with the concept of a “Planned District” for Ocean Beach. It was one of 3 possible planning alternatives, with the others being rezoning or a combination planned district for parts of OB and rezoning. The OB Planning Board votes, Dec 1, 2010. Whether the Board dallied on this issue or had other priorities is not clear, but at one point, the head of the planning department, James Geoff, threatened to pull his staff from assisting the Board if it did not seriously address the Planned District issue. We can laugh at this now, decades later. Thirty-eight years after its inception, the OB Planning Board is still going and functioning. The countless- and thankless hours – that the hundreds – nay, perhaps thousands – of volunteers who have sat in the seats of the Planning Board – spent in keeping this grassroots tradition alive is a testament to the character of Ocean Beach. Despite apathy, burn-out, economic pressures, some individuals have sat on the Board for years, helping to guide OB through construction upswings and economic downturns. In general, the City has worked to undermine the power and authority of the OB Planning Board; the bureaucracy never liked the OB Plan and have resented its power; now- this is not always the case – as right now, today, in 2014, city staffers are working with OB planners in maintaining crucial language in the draft Community Plan that is currently undergoing its own review process. The City and Planning Commission continue their efforts to water down the language of the Community Plan (formerly called the Precise Plan). This can be seen in today’s battle over FAR language which the Planning Commission wishes removed. City government and city service heads and representatives continue to ignore the Planning Board. Theoretically, as the Board is responsible for public facilities and space, any work by the city or its contractors on or around public facilities, vacant city properties or assets, or in the public right of way, should come before the OB Board for notification, confirmation or downright approval. For instance, the City’s attempt to cut down a live, vibrant Torrey Pine on Long Branch Avenue a few years ago should have first come to the Board for authorization. Another for instance: the recent efforts of removing or moving OB park picnic tables due to a few local complaints should have come before the Board as a community-wide issue. And of course, there is the whole issue of gentrification versus the city and Planning Commission issuing variances to get around the requirements of the OB plan – the current issue over the OB Community Plan today. 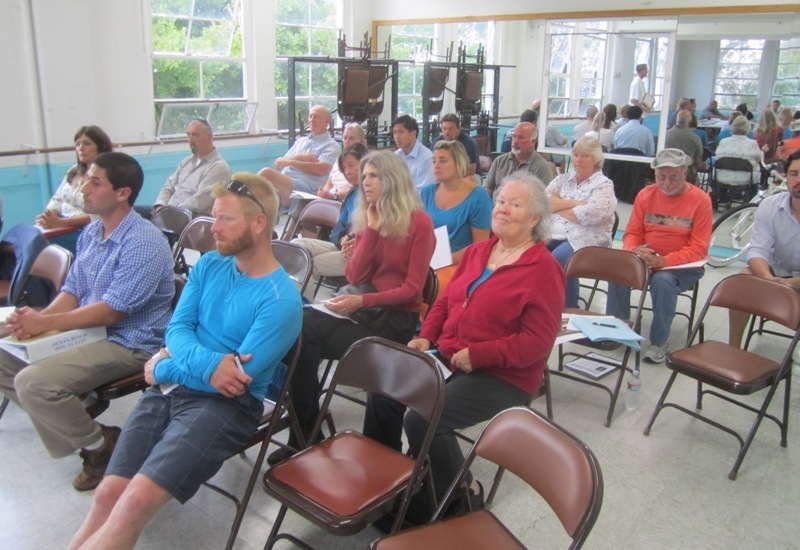 The audience at the June 4, 2013 meeting of the OB Planning Board. 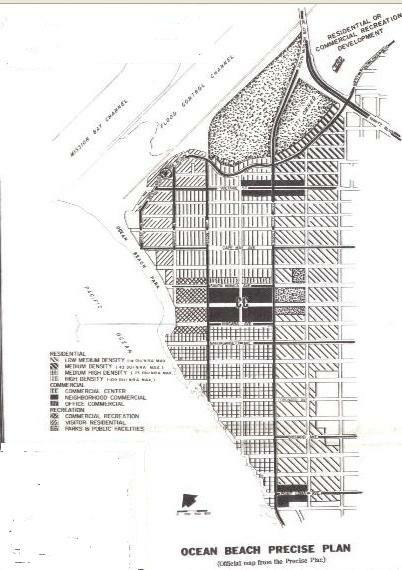 In 1983, there was an attempt to increase the density in part of OB by former Councilman Bill Cleator and large property owners. The town rallied and put a stop to it. Then in the late Nineties the Planning Board was the focus and forum of a campaign against Exxon Oil coming into OB. Working with the City, the Board led the opposition on 3 different occasions to block Exxon. As this story shows, Ocean Beach truly led the way to the democratization of urban and community planning. OB set a precedent followed by countless communities since up and down the state. Today, just in San Diego alone there are over 50 planning committees for its identified neighborhoods. The twists and turns of this story are amazing. There were so many moments when frustrations and feelings of defeat seemed to be overwhelming. But OB and its activists hung on. The activists did hang on and they were there when the first plans for Pen Inc’s massive redevelopment were made public. They organized the first town hall meeting in modern OB history. They formed groups, they did surveys, they circulated petitions. They were there when the City wanted to take the Pen Inc plan to the Planning Commission. In response OB’s activists formed the real planning muscle in OB’s history, the Community Planning Group. The activists of this group led the way for the village on so many levels – so as to come to grips with the need of a grassroots based democratic institution that would make planning decisions and recommendations. It was the Community Planning Group that successfully kept pushing for an election of a planning committee. OB’s activists were there when the City formed “the Committee of 12”. They were there when the City finally released its “new and improved” Precise Plan. They were there circulating petitions to force a community-wide election. They were there on July 3, 1975, when the City Council approved OB’s plan. And OB’s activists were there when the election for the first planning committee took place on May 4th, 1976. They’ve been on the planning board for the last 38 years. OB’s activists are there now, 2014, as OB’s new community plan goes before the current City Council. They helped write the new plan. They’re out there collecting signatures on a petition in support of the plan. Already more than 3,000 signatures have been collected. And OB activists will be at the July 29th City Council hearing at 2pm to ensure that the plan is accepted and approved. OB was saved by its activists during the 1970’s – but every generation has seen its crises – and has responded. Once again, the small town character of Ocean Beach is in question – and once again Ocean Beach has had to respond. What will happen this time? Great retrospective on OB Planning. The time all these volunteers have put in over the years is impressive. The City pays its planners yet OB often comes up with better results from it’s unpaid volunteers. N 1955 My Mom left Ala. & drove 2 the end of the 5 & found OB. Then got a place on Narragansent & A job @ Delta Drug meet my Dad. Got married, moved 2 Cape May & after that had me! That’s how I got 2 OB thank god 4 that.